RICHLAND, Wash. – Research in the Northwest is finding new evidence that a chemical used to harden plastics can damage female reproductive systems. Researchers exposed pregnant monkeys to daily doses of bisphenol-A, also known as BPA. The chemical is found in plastics like water bottles and on cash register receipts. BPA could cause birth defects and miscarriages. The mother’s BPA exposure was passed to the fetus. Eggs, which are formed in utero, did not develop correctly in the fetuses. That means the next generation of females could also have trouble reproducing. Hunt says monkeys have similar reproductive systems to humans. She says that concerns her. “We’re already a pretty vulnerable species when it comes to trying to reproduce. If these environmental effects, like bisphenol-A, actually make the problem worse, then to me it’s going to make it a lot harder for us to have babies,” Hunt says. Hunt says this study confirmed what researchers have already found in rodents and worms. In 2009, there was a huge pot bust in Washington County. Then just last week, federal prosecutors in Maine said that they may seize most of Township 37. There is additional land in surrounding townships that may also be seized, pending the outcome of this case. About 5 miles of this land goes along the Stud Mill Road, and lies dead on the proposed East-West Corridor route. Maine paper mill executives (left to right) Keith Van Scotter, CEO of Lincoln Paper and Tissue; Bill Cohen, director of communications at Verso Mill in Bucksport; and George McLaughlin, manager of manufacturing for Great Northern Paper in East Millinocket talked about challenges and future prospects for the industry at the Bangor Region Chamber of Commerce Early Bird Breakfast in Bangor on Wednesday morning, Sept. 26, 2012. BANGOR, Maine — Executives from three of Maine’s paper mills told 50 businesspeople that reports of the demise of Maine’s pulp and paper industry have been greatly exaggerated. Van Scotter; Bill Cohen, director of communications for Verso Paper Corp. in Bucksport; and George McLaughlin, manager of manufacturing for Great Northern Paper in East Millinocket, were the main speakers at Wednesday morning’s Bangor Region Chamber of Commerce Early Bird Breakfast. Van Scotter added that pulp and paper is being used to make rayon clothing in the Far East, opening up a whole new market. Cohen provided some interesting facts to show how crucial the industry is to Maine’s economy. He said there are more people employed nationally in the pulp and paper industry than in the auto industry, and that the average paper industry job in Maine pays about $60,000 a year. He added that $450 million in annual salary checks are sent out by Verso to employees with Maine addresses. Chamber president and moderator John Porter asked the panelists about what workforce issues they face now and in the future. McLaughlin talked about the graying of the current workforce and a shortage of younger, skilled workers to replace them. “Our average age in the workforce now is 57, so we have a challenge in hiring younger workers with the right skill set,” he said. Talk shifted to the cost of doing business, specifically electricity. McLaughlin talked about the prohibitive expense of having to run a backup boiler on oil recently. The price of oil is making transportation expensive as well. Cohen said as little as two years ago, 70 percent of shipping by his mill was done by rail and 30 percent by trucks. Now it’s 40 percent rail and 60 percent trucking. The rising costs of toll roads is making shipping by truck even more costly. “Our toll cost per travel mile is almost 50 cents per mile,” said Van Scotter. Expanding shipping by railroad, expansion of Maine’s rail network, and building an east-west highway were all on the three executives’ wish lists. Porter asked the panel about the federal and state regulation of the paper industry. “First, compliments to the governor and Legislature for looking at regulations to make it less cumbersome for business while still protecting the environment,” said Cohen. Van Scotter said although Maine is more heavily regulated than many other states, it’s ongoing trends in federal regulation that cause concern. “This presidential administration is worse, and the previous one wasn’t much better,” Van Scotter said. “It’s frightening. One of the last topics was competition, specifically from foreign countries. Chief among them are foreign tariffs, subsidies, wage rates and government aid. “The biggest challenge is foreign companies with access to free and unlimited working capital, which we don’t have,” said Van Scotter. McLaughlin referred to mills that are reopening in Quebec and Nova Scotia, citing the current U.S.-Canadian exchange rate as well as the subsidies the mills get from the Canadian government. The event was the first of four in the Chamber’s “business revolution” topical programs. Others include the transportation and higher education bonds on the November ballot and a look at health care. ANACORTES — Despite voices of opposition outside council chambers Monday night, the Anacortes City Council voted to move an application forward to the county that would expand the city’s long-term growth area and potentially pave the way for one of the largest bottling plants in the country. The application, made by Tethys Enterprises Inc. on behalf of property owners, requests moving 11.2 acres of county rural reserve land into the Anacortes UGA. If approved through a county process, Anacortes could annex the land, which would allow Tethys to move forward with plans to build a massive bottling plant on the southwest intersection of Stevenson and Reservation roads, south of March Point. Tethys filed the application with the county’s planning department July 31. Mayor Dean Maxwell signed it without council approval. Maxwell has said he heard about the application on the day it was due to the county and signed it to avoid waiting another year or more before the process could start again. The application for a UGA expansion included initial plans from Tethys to build a large beverage bottling facility and rail transfer station on 30 acres — including the 11.2 in question — as well as a rail spur to connect with a Burlington Northern Santa Fe main line north of the facility. A 2010 contract with the city allows Tethys to buy 5 million gallons of city water per day, available through 2050, to bottle. Anacortes currently has rights to 55 million gallons of water per day, and sells 21 million gallons per day to customers. During Monday night’s meeting, the council voted 6-1 to move the application forward. Councilman Ryan Walters voted against the move, instead voting to table the decision until Dec. 3. Walters said Tethys’ contract with the city gives the company until Dec. 1 to submit a legal description and map of the property where it plans to build. He said before that time, Tethys could provide the City Council with more information about the proposed plant. Walters said that the City Council can impose conditions on the Tethys facility, such as environmental and traffic mitigation, while it still has a say on the process. Once the process moves to the county, Walters said the city will have few chances to weigh in on the topic. “I’ll repeat what I said earlier, that the reason to delay this is to keep the ball in our court,” Walters said. Councilman Bill Turner said Tethys can’t submit detailed building plans until it has secured a site for the plant. “When you have a project like this and you don’t have a piece of property, you don’t have much,” Turner said. The county process will allow the city and the public to get a better idea of the Tethys proposal, he added. In a personal interview, Anacortes Public Works Director Fred Buckenmeyer said the city included safeguards within its contract with Tethys that will keep the company from exporting containers of water larger than 10 gallons, and will have Tethys pay for the necessary upgrades to the city’s water treatment plant for the company’s use. Buckenmeyer said Tethys will have to submit a permit application for a site, which would include a building permit and site permit that would spell out exact site plans, by Dec. 1, 2014. Councilwoman Cynthia Richardson said the county process will include a State Environmental Policy Act review, possibly an Environmental Impact Statement from Tethys and public meetings. Councilman Brian Geer proposed moving the application forward at the meeting, citing a need for manufacturing plants such as Tethys to offer jobs for the area that are in short supply in the many storage facilities currently found in Anacortes’ light manufacturing zone. While the council prepared to make its decision on expanding the UGA, a group of approximately 115 people who oppose Tethys’ purposed bottling plant gathered around the Municipal Building on Sixth Street before the meeting Monday evening, shouting “Save our Skagit” and waiving signs and a giant salmon puppet. Opponents say they’re concerned about the availability of water under a contract Tethys signed with the city, salmon habitat and lack of pubic process regarding the proposed bottling facility. A resolution as to whether or not to support the modification of the urban growth area (UGA) to accommodate Tethys’ proposal to build a one million square foot bottling plant entitled to five million gallons of municipal water per day through 2050. BEFORE THE MEETING, you are invited to a Paint the Town Blue Rally to oppose the proposed one million square foot bottling plant in front of the Anacortes City Hall, 904 6th St., Anacortes. Wash.
First Our Homes, Now Our Water? Kate Fried, Food & Water Watch, (202) 683-2500, kfried(at)fwwatch(dot)org. WASHINGTON – August 22 – Following its disastrous foray into the housing market, Wall Street’s latest earnings scheme is as close as your kitchen sink: the finance industry is increasingly targeting public water systems. A new report released today by the national consumer advocacy group Food & Water Watch, Private Equity, Public Inequity: The Public Cost of Private Equity Takeovers of U.S. Water Infrastructure reveals that as of January 2012, private equity players had raised $186 billion through 276 infrastructure funds and were seeking another $93 billion to take over infrastructure worldwide. Food & Water Watch’s new report shows that because private equity players typically seek a 12 to 15 percent return on investment, they quickly flip assets. Often, they do this after scrimping on service, investing in elaborate and unnecessary projects, quashing transparency and avoiding taxation, in turn driving up prices for consumers. Even the finance community has identified flaws in these deals. In 2006, Standard & Poor’s warned that due to excessive borrowing, private equity takeovers could result in downgraded credit ratings. Governments could also have to step in and bail out the privatized systems if economic conditions prevent refinancing short-term acquisition debt and the private operators default. George Marlin, a career investment banker and director of the Nassau County Interim Finance Authority (the state board that oversees the county’s finances and which earlier this year rejected the county’s contract with Morgan Stanley to serve as a financial advisor on the privatization of the county’s sewer system) called the county’s privatization proposal an “ill-conceived backdoor borrowing scheme” akin to using a credit card with a high interest rate to pay off a loan with a lower one. Despite obvious conflicts of interest, private equity players are increasingly stepping in as financial advisors to cash-strapped municipalities exploring possible privatization deals. Compensated primarily through the execution of such plans, advisors from private equity firms have a direct financial interest in these deals, much to the detriment of local residents. When municipalities privatize their drinking and wastewater systems to fill budget shortfalls, private equity firms have greater bargaining power to negotiate more lucrative deals. Many local governments, especially cash-strapped ones, are ill-equipped to evaluate proposals from multinational finance firms or to negotiate a fair contract, making them vulnerable to expensive, unnecessary deals. Firms have also been known to low-ball contract bids, basing costs on rosy water use and growth estimates or pessimistic financial projections. After winning a privatization contract based on these inaccurate figures, a firm would renegotiate the contract to shift risks and costs to the public. “Private equity players aren’t investing in water out of a sense of civic responsibility. Their first and foremost motivation is profits, which has already proven incompatible with delivering an essential resource to consumers,” added Hauter. Instead of using budget gimmicks like privatization, Food & Water Watch recommends that municipalities address their fiscal challenges in an open and transparent manner. Rather than pursuing such risky privatization deals, governments can improve services and protect the integrity of the water and sewer systems through public-public partnerships. Forged between public water utilities, government entities, or non-governmental organizations, these partnerships pool resources, buying power and technical expertise to enhance public efficiencies and service quality—all at a lower cost to consumers than privatization. Private Equity, Public Inequity: The Public Cost of Private Equity Takeovers of U.S. Water Infrastructure is available here. 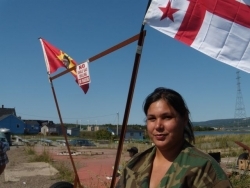 AULD’S COVE, NS—Mi’kmaq people from Cape Breton and the Nova Scotia mainland are preparing to set up a “partial blockade” of the Trans-Canada Highway in Auld’s Cove, on the mainland side of the Canso Causeway, the access point to Cape Breton. 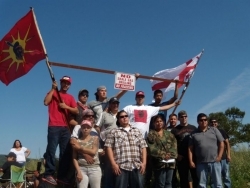 By 1:30 yesterday afternoon, about 25 people had gathered, setting up flags and signs, and organizing a teepee and food for the warriors and their supporters. The blockade is in opposition to exploratory oil and gas drilling by PetroWorth Resources, scheduled to begin later this year on the shore of Lake Ainslie in western Cape Breton. Mi’kmaq communities—andmany non-Indigenous residents around Lake Ainslie—have been clear in theiropposition to exploratory drilling around the watershed, saying that no amount of money is worth risking the pristine water resources that Lake Ainslie supports. Emmett Peters of Paq’tnkek (Afton) emphasized the importance of the action for future generations. “I don’t know if you’re familiar with the 1752 treaty, [which was affirmed in the 1999] Marshall Decision, where we’re allowed to hunt and fish. So they thought about us 300 years previous. That’s how strong that treaty was,” said Peters. A ceremony is planned for this morning at the blockade site, to which all people are invited. Organizers of the action are expecting supporters from Paq’tnkek, Eskasoni, Waycobah, Membertou and Potlotek First Nations. They are also expecting non-Indigenous supporters from the Green Party, Protect Lake Ainslie and the Margaree Environmental Association. Peter Bernard, a Chief of the Mi’kmaq Warrior Society from Waycobah, estimated this action will last two days. “We’re trying to do this as peaceful as possible,” said Marshall. But she, Peters and Bernard added that they will not give up if the partial blockade doesn’t affect the changes they are looking for: a complete halt on any oil and gas exploration or drilling at Lake Ainslie. Marshall said that if the traffic slowdown doesn’t succeed in stopping PetroWorth’s well, a full blockade will be organized. PetroWorth Resources could not be reached for comment at the time of publication. Moira Peters lives and bikes in Halifax. Ben Sichel is a teacher and writer, and editor for the Halifax Media Co-op, where this article was originally published. BANGOR, Maine — Given its location, if Maine is to prosper in the evolving global economy, it must take advantage of every potential opportunity that it can. And when it comes to competing, the state needs to address some major shortcomings in terms of getting goods and products to major markets in the Midwest and such major Canadian cities as Montreal, Cianbro Corp. Chairman and CEO Peter Vigue said Thursday during an address to movers and shakers in the forest products industry. The solution, as Vigue sees it, is the proposed east-west highway, which has been talked about for decades. The effort to get the private toll highway built recently got a boost when Vigue decided to lead the charge. Vigue spoke about the proposed toll highway at the Sea Dog Banquet & Conference Center at the invitation of the Forest Resources Association, a national organization that represents all segments of the wood fiber supply chain, including landowners, land managers, wood suppliers, wood buyers and others, according to its website. Joel Swanton, northeast regional manager for the association, said association officials thought it would be a good idea to invite Vigue to speak because many of the association’s Maine members had questions about the project and its potential effects on their industry. could be important allies in the project. According to Vigue, one only need look at a map of North America to understand how vital the 220-mile highway across Maine would be to the state’s long-term economic viability. The Georgia-Pacific Corp. mill in Old Town and the Lemforder plant in Brewer are just two of the many major employers that have left Maine in recent years. Vigue said that one association member told him that evening that it cost $1 a mile to transport wood. “That is a big deal considering where we live and where we’re located,” he said. Those are some of the reasons why Vigue says he is leading the effort to get the highway built. Proposed is a 220-mile toll road that would run a fairly straight shot from Calais due west to Coburn Gore, Vigue said. The road would be built on private rights-of-way, would run below the proposed “Restore” national park area and avoid existing protected natural resources. Despite some questions about potential new costs to the industry, such as toll costs, there was virtually no opposition to the planned road during Thursday’s meeting. The highway, however, is not universally supported. Earlier this month, the Piscataquis County town of Monson became the first Maine municipality to impose a six-month moratorium on privately owned highways and utility corridors. The vote to that end was unanimous — 47 to 0. Anti-east-west highway signs also have been popping up in Dover-Foxcroft and other nearby communities. Some concerns cited by foes include fears that land will be taken by eminent domain and potential adverse environmental effects — concerns Vigue has been working to allay. “We have no intention of taking people’s property, we have no intention of impacting people in a negative manner,” he told association members Thursday night. “All I ask you to do is this: Look at our track record. Look at how we treat our people. Look at how we treat Maine companies and look at our history,” he said referring to Cianbro Corp.’s history in Maine. While Vigue spoke to forest resources association members in the Sea Dog’s Penobscot Room, about a dozen protesters outside held up signs decrying the project. The rally was organized by Friends of Piscataquis Valley, which is part of a larger coalition called Stop the East-West Corridor, said Sidney Mitchell of Dover-Foxcroft, a founding member of the former group. Another issue Vigue addressed Thursday was whether Canadian companies had more to gain from the road than Maine companies. “It doesn’t matter if you’re in Maine or in Canada. We’re all facing the same challenges” he said. Asked about the time frame for the project, Vigue said plans call for lining up financial resources in the next nine months to a year. The next step, the design and right-of-way acquisition phase, is expected to take another three years and construction, three more years. JAY — “I can tell you in all honesty that I’ve never been as excited about a role as I am about this one,” said Darryl Brown, Program Manager for the East-West Highway project, at the Jay-Livermore-Livermore Falls Chamber of Commerce meeting last Friday. Brown is working with Cianbro CEO Peter Vigue, who has spearheaded the project. Brown explained that the concept of an East-West Highway has been discussed periodically by state legislators since the 1980s. Studies and evaluations were done, but nothing happened. “Why was it never done? There’s no money,” said Brown. “Peter Vigue has come up with a new solution: Let’s do it privately. He explained that his job was to define the route and promote the program. Brown became involved, he said, due to his concern about the long-term health of Maine’s economy. He noted that Maine’s median age is the oldest in the nation. In 2010, Maine’s gross domestic product growth was only 0.4 percent, ranking 46th in the U.S. That same year, the total non-farm employment growth was 0.1 percent, ranking 43rd in the nation. Brown cited Maine’s poverty level as 36th worst in the U.S.
“Are we satisfied with this? How can we be?” he asked. Maine, he said, is united by nature with Canada, divided only by the U.S. border. The largest state economic investors in Maine — Emera, TD Bank, McCain, Irving Forest Products, and Oxford Frozen Foods — also have Canadian connections. One third of Maine’s foreign-bound goods are exported to Canada. A total of 37,000 Maine jobs depend on Canadian-U.S. Trade. Brown showed a map displaying the major transportation routes involving Maine. These include the Ontario-Quebec continental gateway, and the Atlantic gateway. Maine provides the linkage between these two routes. The proposed East-West Highway would be a private toll road extending from Calais to Coburn Gore. It will be built with private financing and be maintained by a private entity. It would be patrolled by Maine law enforcement agencies. Brown noted that despite all of the north-south connections in northern New England, there is no major east-west highway. He noted that from Coburn Gore, it is a relatively direct east-west line to Sherbrooke, where a major highway leads to Montreal and then Toronto, Detroit, and Midwest markets. Additionally, said Brown, the East-West Highway would have major implications for ocean shipping in Eastport. Goods from foreign markets will be brought through an improved Panama Canal and up the East Coast to Eastport, or from the Suez Canal west to Maine. Eastport has the deepest ocean water of any sea port in the lower 48 states. Rail also plays an important part in the transportation scheme, he noted. Environmental challenges abound, and Brown said he has been working with the Nature Conservancy to find a route that would minimize environmental impact. The road will be 220 miles long, crossing the Penobscot and Kennebec rivers along the way. There will also be numerous stream and wetland crossings. The project will be constructed so that it is ISO 14001 compliant, which means it will be subjected to the highest possible level of scrutiny by a third party. “We have committed to avoiding conservation areas,” said Brown, who added that the project needs to be made vehicle-friendly as well. The road corridor will use a total of 13,333 acres. It has six proposed interchanges with other roads and towns at this time, although that number could change. Tolls will be charged along the road in an attempt to recoup the $2.1 billion project cost. -Improving access for tourists to Maine. “Maine can become the bread basket of the Northeast,” said Brown. The road corridor will be 500 feet wide. Eminent domain will not be used for land acquisition. There will be wildlife crossings built above the highway to allow animals to cross safely and reduce the number of collisions with vehicles. Canadian weight limits and tandem trailers will be used. Brown noted that the project will be constructed by Maine people and companies. Brown was also asked what percentage of the road will use existing corridors. “We’re still defining that, refining that,” he said. It will not pass along existing state and federal highways, but as much paper company land and woods roads as possible will be used. “What’s a way to get this from being something for the Canadians to bypass the rest of Maine?” attorney Ron Aseltine asked. Brown responded that the highway will be tremendous in its positive impact on tourism and will allow for greater economic opportunities in Maine as a whole. “This is a partnership of everyone in Maine. It’s not just Cianbro,” he said. Washington, DC–(ENEWSPF)–September 10, 2012. Traces of pesticides in drinking water were found in eleven rural elementary schools in Oregon, according to a U.S. Department of Agriculture (USDA) study released on August 30. The study shows a disturbing variety of pesticides that when combined could have dramatic impacts on the health of the children that consume this water on a daily basis. Children face unique hazards from pesticide exposure. They take in more pesticides relative to their body weight than adults in the food they eat and air they breathe. Their developing organ systems often make them more sensitive to toxic exposure. The body of evidence in scientific literature shows that pesticide exposure can adversely affect a child’s neurological, respiratory, immune, and endocrine system, even at low levels. The Food Quality Protection Act of 1996 directs EPA to set pesticide residue standards ten times stricter than those considered acceptable for adults, however, this standard has often been ignored. In addition to the harmful effects that these chemicals have on children, the combination of these chemicals can be more detrimental then each chemical individually. Teresa Huntsinger, who works on clean water issues for the Oregon Environmental Council, is concerned about the schools that have multiple pesticides in their water. “When drinking water levels are set, they’re assuming there’s one pollutant at a time and there’s very little science to understand what can happen when you have multiple chemicals together. There may be synergistic effects in the way these chemicals interact with each other,” Ms. Huntsinger said in a statement to Oregon public broadcasting. Synergistic effects between multiple pesticides and chemicals are one of the largest gaps in the government’s ability to protect the public from adverse health effects. Mixing pesticides is a clear concern because they may have a stronger effect when combined. A 1999 study found that mixtures of three common groundwater contaminants —two pesticides and a fertilizer (aldicarb, atrazine, and nitrate)— at concentrations allowable in groundwater by EPA are capable of altering immune, endocrine, and nervous system functions in mice. Atrazine, the chemical most found in this groundwater study, is used nationwide to kill broadleaf and grassy weeds, primarily in corn crops. Atrazine has been shown to be harmful to humans, mammals, and amphibians even when the amount used is less than the government allows. Atrazine is also associated with infertility, low birth weight, and abnormal infant development in humans. The U.S. Fish & Wildlife Service acknowledges that the chemical may harm the reproductive and endocrine systems in fish species, and there have been other reported cases of it leeching into drinking water both nationally and in Oregon. Additionally, frogs exhibit hermaphrodism when exposed to below below-legal allowable levels of the herbicide atrazine in waterways. The effects of atrazine are so detrimental that some members of Congress are looking to ban its use. In addition to atrazine, diuron, metolachlor, norflurazon, and simazine, were found in the Fairplay ground water supply. Simizine has been known to be harmful to bees and aquatic species. Simazine also has a history as of leeching into water and has been detected in other groundwater studies. In Ewing Elementary school drinking water, researchers discovered the presence of 2,4-D. 2,4-D is a chlorophenoxy herbicide and scientists around the world have reported increased cancer risks in association with its use, especially for soft tissue sarcoma and non-Hodgkin’s lymphoma. Research by EPA suggests that babies born in counties with high rates of chlorophenoxy herbicide applications to farm fields are significantly more likely to be born with birth defects of the respiratory and circulatory systems, as well as defects of the musculoskeletal system like clubfoot, fused digits and extra digits. These birth defects were 60% to 90% more likely in counties with higher 2,4-D application rates. The results also show a higher likelihood of birth defects in babies conceived in the spring, when herbicide application rates peak. Children and pesticides don’t mix. Educate your Member of Congress about the School Environment Protection Act of 2012 (SEPA). Beyond Pesticides believes that this federal legislation will ensure a healthy learning environment for all students. In March, U.S. Representative Rush Holt and colleagues introduced the SEPA, which will protect school children from pesticides used both indoors and on all school grounds nationwide. The legislation also bans the use of synthetic fertilizers. SEPA was first introduced in November 1999 in both the U.S. Senate and House. The bill language is based on state school pest management laws. It also mirrors the structure of the Organic Foods Production Act of 1990, which established a national committee to oversee the program as well as an established a list of synthetic substances allowed for use within the program. A form of SEPA has passed the U.S. Senate twice since and, together with other legislation, indicates broad support for a national mandate to stop hazardous pesticide use in schools. To learn more about this legislation, see Beyond Pesticides’ SEPA webpage or visit Beyond Pesticides Children and Schools program page.